Travel back in time to the era of punk with Costume Direct. The 1980's was all about the bright colours, neon, fishnets, leg warmers, tutus and big hair! Think Cyndi Lauper costumes and Lets Get Physical with plenty of lycra! The 80's saw plenty of shell suits and the era of rock- with lots of black leather. Michael Jackson costumes and KISS costumes are perfect if you're attending an 80's party or the classic Top Gun costume! Shop now, available to ship Australia wide including Sydney, Melbourne, Perth, Brisbane, Adelaide and Canberra. 1980s fancy dress party . Let's dance! Stuck for some 80s costume ideas? Looking for Cyndi Lauper costumes or Freddy Mercury costume, 90s punk costume? Look no further than Freddie Mercury's men outfit! Beat it in MJ'sThriller jacket, or 80s Cyndi Lauper womens costume. She-bop along with bursts of neon and fishnets! Stock up on sweatbands and bangles, and shell suits, mullets and MC Hammer pants, and cast your memory back to the delights (or horrors) of 1980s fashion. 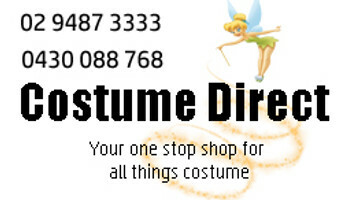 Whether you want a punk rocker costume or to be a material girl who just wants to have fun, Costume Direct has all the 1980s and punk costumes for you!